Whitney Vickers | Greene County News Linda Riffle and Debbie Butner lead the way in organizational efforts for the Fairborn Flyzone. They had a booth at the Sports and Fitness Expo as part of the Air Force Marathon activities. 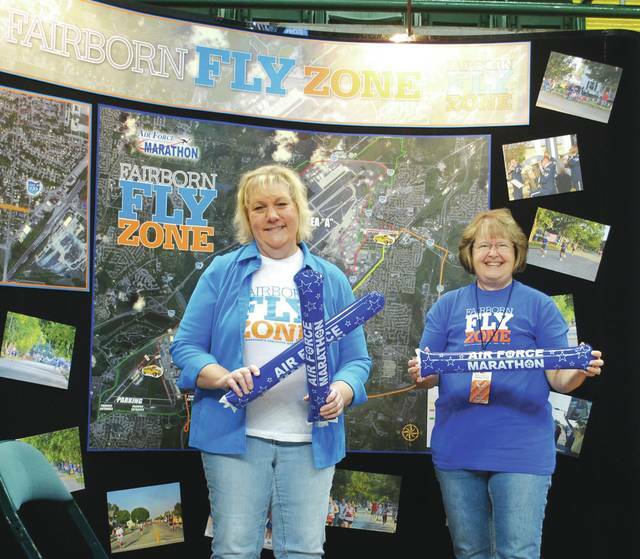 FAIRBORN — Air Force Marathon spectators are invited to cheer on the runners from the Fairborn Flyzone as participants will complete miles eight-through-10 in the heart of downtown Fairborn. It opens 7-11 a.m. Saturday, Sept. 15 and will include live entertainment, roaming superhero mascots, coffee and breakfast, a free all-supplies-included poster-making station, bleacher seating, a special veteran’s section and a free shuttle bus to and from the start and finish lines at the National Museum of the United States Air Force. The eight shuttle buses, which are Fairborn City School buses, are slated to depart from the start line by approximately 7:40 a.m., arriving at Rent-a-Center in Fairborn between 7:50-7:55, which is about a half block from the Flyzone. It will shuttle back by approximately 9:30 a.m., 9:45 a.m., 10 a.m. and 10:15 a.m.
Flyzone attendees may also drive themselves to the downtown area and park off one of the side roadways off Main Street. Flyzone organizers said they typically see the first marathon athletes pass through town beginning by approximately 7:45 a.m. starting with the wheeled participants. Lefty’s, Foy’s Grill and Chantilly Creamery are each expected to open up and include a special Air Force Marathon breakfast. Rhythm Ramblers are expected to provide live entertainment, in addition to the University of Dayton Alumni Band. Rob D’agostino, a Fairborn man, will also provide entertainment as a live DJ during the event. Local motorists should be aware that the some roads will close Sept. 15 as the marathon course includes a section of Xenia Avenue, Maple Avenue, Grand Avenue and Main Street. To get to the Flyzone, event organizers recommended traveling down Dayton Drive and parking along a side street. https://www.fairborndailyherald.com/wp-content/uploads/sites/50/2018/09/web1_flyzone1.jpgWhitney Vickers | Greene County News Linda Riffle and Debbie Butner lead the way in organizational efforts for the Fairborn Flyzone. They had a booth at the Sports and Fitness Expo as part of the Air Force Marathon activities.